Mined since the 17th Century in the Catalan mountains, the garnet symbolises constancy and loyalty, its deep red colour reflecting the Mediterranean character of the capital of North Catalan culture. The stones were also believed to cure blood disorders, and excessive anger! Garnets were viewed as prestigious stones in Catalonia from around 1750 although the production of garnet jewellery actually dates back to the 11th century, when the jewels were mined in Estagel, Costabonne and the Col de la Bataille. Today most garnets come from Madagascar, Sri Lanka, and Africa, but what makes them unique to Perpignan is the way in which they are cut, with a clear scarlet brilliance rarely seen elsewhere, and finely hand crafted settings made out of eighteen carat gold. 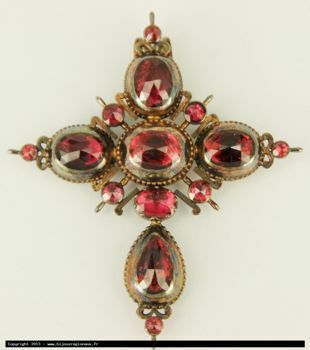 Symbol of regional pride, a popular piece was the “Croix Jeannette”, a cross, mounted with Perpignan garnets. Believed to have been named after the ‘Fête de la Saint Jean’, a time of the year when workers received their quarterly wage, its combination of gold and garnet reflected the red and gold Catalan flag. Changing fashion, two world wars, a decreasing regional pride, and rising prices for Catalan jewellery, saw a decline in the industry through the 20th Century. In the 1980’s, the Association “Grenat de Perpignan” was created, and the garnet was resurrected, old methods to produce new, modern designs. 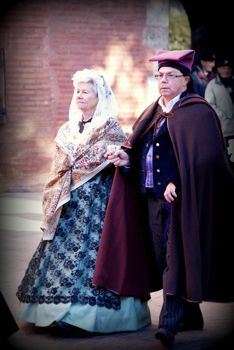 On the Fête de la Saint Eloi, a variety of events bring out that Perpignan sparkle, but the highlight is undoubtedly the much talked of procession of the Confrérie du Grenat (Brotherhood of the Garnet). This parade in historical costumes leaves the Palais de Congrès around 10h, heading for the église Notre-Dame La Réal where a mass and solemn ceremony of ’intronisiation’ (investiture – remember, this is a brotherhood!) takes place. The public are invited to join in by decking themselves out in the costume of their own region, or favourite period of history, and entering a competition for best costume. The whole thing is followed by colourful ‘danses Catalanes’. Although garnets are no longer mined in the region, small examples of the stone are still to be found in the Fenouillèdes, Costabonne or the garrigues above Ille sur Tet. However, leave your spade at home, and enjoy the magnificent views in the knowledge that you could be sitting on a fortune – it is illegal to dig for this little jewel! Find out more about the grenat, or the Fête de la Saint Eloi at the Institut du Grenat in Perpignan, who are hoping to create a permanent museum or exhibition in the future to showcase the Grenat de Perpignan.